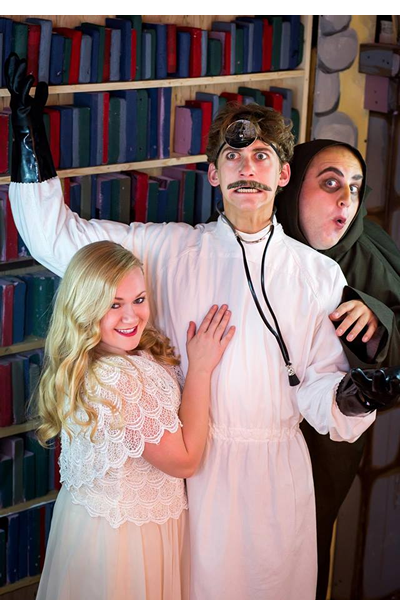 A monster hits the boards as Young Frankenstein stomps onto the stage at the Covedale Theater. Based upon the movie created by Mel Brooks and Gene Wilder, the musical tells the story of the grandson of the famous scientist who inherits his grandfather’s castle in Transylvania. In this hilarious parody and homage to old horror films, we first meet Dr. Frederick Frankenstein (who insists his name is pronounced Fronkenstein) teaching an anatomy class on the functions of the brain. Fredrick, portrayed by a manic Christopher Logan Carter, explains his scientific methods in the song “The Brain” which is a fast patter song reminiscent of Gilbert and Sullivan. Frederick has eschewed the findings and methods of his famous grandfather but must now travel to Transylvania to settle the estate of his recently deceased relative. Surrounded by an ingenious set designed by Brett Bowling, Frederick enters Mel Brook’s insanity by first meeting Igor (Tyler Gau) the creepy hunchbacked caretaker whose hump keeps moving from side-to-side. Gau, echoing Marty Feldman who appeared in the movie, is one of the highlights of the show as an alternately annoying and, ultimately, helpful assistant to the brain surgeon. They bond with the song “Together Again for the First Time”. Frederick, who has left behind his fiancé Elizabeth Benning (Rachel Barkalow), is immediately smitten by local resident Inga (Heather Hale). In a very cleverly constructed scene in a wagon, Inga sings “Roll in the Hay” with all of the implications of that phrase. Mel Brooks wrote the music and the lyrics which are extremely clever but are replete with outrageous puns, other plays on words and very sophomoric humor. However, the songs and the script co-authored by Brooks and Thomas Meehan is hilarious in a “guilty pleasure” sort of way. Arriving at the castle. Frederick meets the austere, suspicious housekeeper Frau Blucher (Leslie Hatch) which starts a running gag when horses whinny each time her name is spoken. We soon discover that Frau Blucher and grandfather were a “number” as she sings the campy “He Vas my Boyfriend”. While investigating the castle, Frederick discovers some documents and a secret laboratory where his grandfather created the infamous monster. Frederick suddenly becomes obsessed and, with the help of Igor, Inga and Frau Bluher, creates his own monster (Peter Cutler). The monster escapes, of course, and terrorizes the townspeople while Frederick and company try to find him. This is a very fast paced show ably directed by Bob Bruner. All of the characters are running amok throughout the show with excellent assistance by the ensemble, comprised primarily of recent university graduates who display good singing and dancing ability. In many ways, this is an old-fashioned musical with lots of music and dancing. In modern shows, we rarely see large ensemble production numbers but there are six in this production including “The Happiest Town in Town”, “Join the Family Business”, “Transylvania Mania”, “He’s Loose” and the finale. The choreograph (by Jeni Bayer Schwiers) allows the youngsters in the ensemble to cut loose with some madcap dances and several excellent tap routines. One of the highlights of the show (and the movie) comes in the scene where Frederick tries to convince the locals and other scientists that the monster is human and capable of both motions and emotions. He demonstrates the monster’s abilities with a vaudeville-like show featuring himself and the monster singing Irving Berlin’s classic song “Puttin” on the Ritz”. Both characters are dressed in tuxedos as they sing and soft-shoe their way through the number. They are then joined by Igor, Inga and Frau Blucher and finally by the townspeople who fill the stage with raucous and exuberant tap dancing. The monster also does a “shadow dance” with his image projected through a curtain. In typical Marx Brothers schtick, the “shadow” doesn’t always follow the movements of the monster. 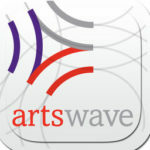 Music Director Ron Attreau leads a band of nine musicians though a wide variety of music styles including haunting melodies, jazz and typical Broadway musical numbers. The band is good but occasionally too loud. A quibble I had is that, frequently, I could not hear all of the lyrics, especially when the ensemble was singing. This does not interfere with the story-telling but you can miss a number of one-liners. They also garbled one of the best lines in the show which is a pun on the song “Chattanooga Choo Choo” when Frederick first arrives at the Transylvania Station. Song highlights in the second act include “Listen To Your Heart” (a duet with Inga and Frederick) “Please Send Me Someone” sung by the Hermit (Aaron Whitehead) and “Deep Love” sung by Rachel Barkalow (Elizabeth) and then as a duet with the baritone voice of the monster (Peter Cutler). The set designs by Brett Bowling for the last several Covedale shows have been excellent but this one tops them all. The stage is dominated by the castle which, at times, represents both the outside and the inside. The motif is medieval with a primary stone structure and stairs with adornments including gargoyles and a suit of armor. The castle has two stories with the study on top and the secret lab below. The operating table elevates which is used for a tryst between Inga and Frederick (embarrassingly interrupted by Elizabeth) and the creation of the monster. The scene with the monster meeting the hermit is done in the wings. Denny Reed has intertwined lights in the castle which illuminate various parts of the structure to, mostly, comic effects. Caren Brady has designed appropriate costumes including pheasant designs, a Swiss Miss costume for Inga, an austere dress for Frau Blucher and large platform shoes and green makeup for the monster. The audience, most of whom had probably not seen the show before, started with polite clapping but, in the end, really got into the show and clearly enjoyed it. So, you might want to complete your Halloween festivities with a visit to Transylvania via the Covedale Theater as Young Frankenstein runs through November 12. The next production is Annie. This was written by Sheldon Polonsky. Posted on Friday, October 20, 2017, at 8:24 pm. Filed under Stage Insights Reviews. Bookmark the permalink. Follow comments here with the RSS feed. Comments are closed, but you can leave a trackback.